Have you ever been tempted to buy fake jewellery? Maybe you purchased some nice jewellery items and didn’t even think to check if it was real. We have put together some great examples to help you if you are in any doubt. 1. Check your jewellery for a stamp or hallmark. 9 Carat Gold, 14 Carat Gold, 18 Carat Gold, 22 Carat Gold, 950 Platinum, 950 Silver. There are only 4 assay offices in the UK. These are London, Birmingham, Sheffield and Edinburgh. Always check for these hallmarks. 2. Is the item being sold online? Does the seller have an original image, or has it been stolen from a reputable company? If you can’t see the jewellery item in the photograph, our advice is – Don’t buy it. 3. Does the item come with a return policy? 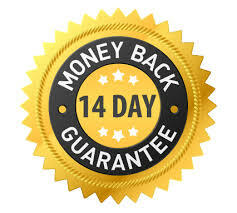 You should have at least 14 days to bring the jewellery product back as standard. 4. The links on any good quality bracelet or necklace are NOT pinched together, they should be soldered together and really smooth. 5. 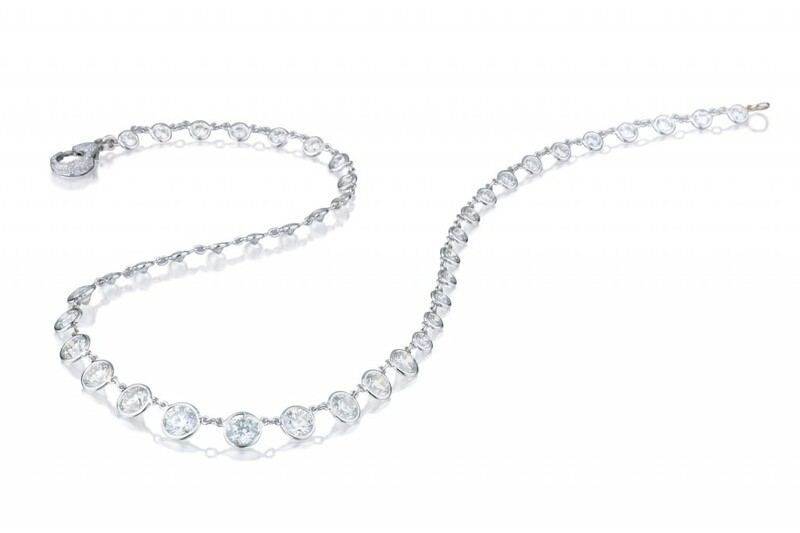 Top brands such as Tiffany will stamp each jewellery item with the Tiffany & Co hallmark. (e.g. Tiffany & Co. 925, or T & Co. 925) Look out for these types of stamps when purchasing your jewellery items. Under a bright light look at the underside of the ring. 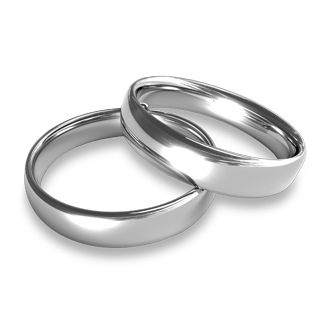 If the ring is rhodium-plated, the yellow gold can show through slightly due wear. You can check the underside of a ring for a stamp such as “14k” or “10k” This will signify what type of gold the ring is made of. If you see this stamp, and the ring is silver-coloured, it’s rhodium-plated. 7. Real diamond rings come with a certificate, normally from the GIA. If your new diamond jewellery item does not come with a certificate, ask for it. Read more on fake diamonds here. 8. Check the cards, or other paper work that comes with your jewellery item. They should be of good quality and the writing will be sharp not blurry. This can also be a good indicator that something is wrong. 9. How to test if the gold is real. The magnet test. Gold it not magnetic. 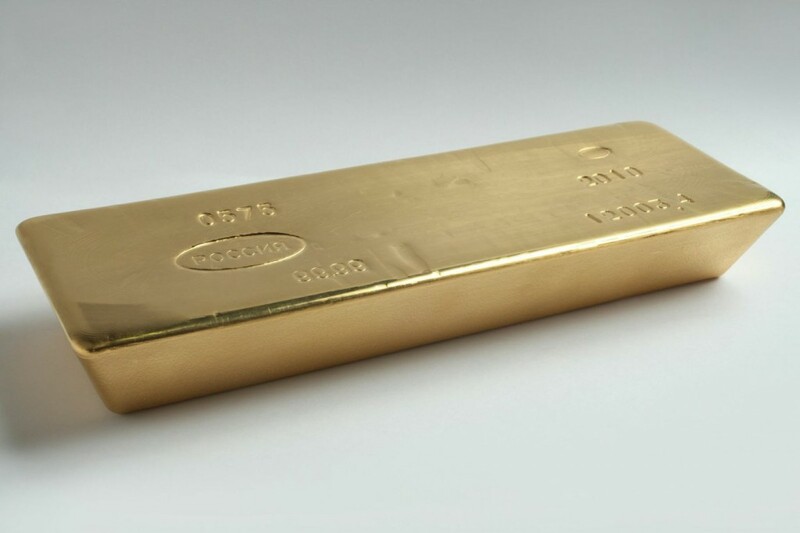 If your gold sticks to a magnet, its not gold. The byte test. Gold is a soft metal. You should be able to make a slight indent on gold with your teeth. 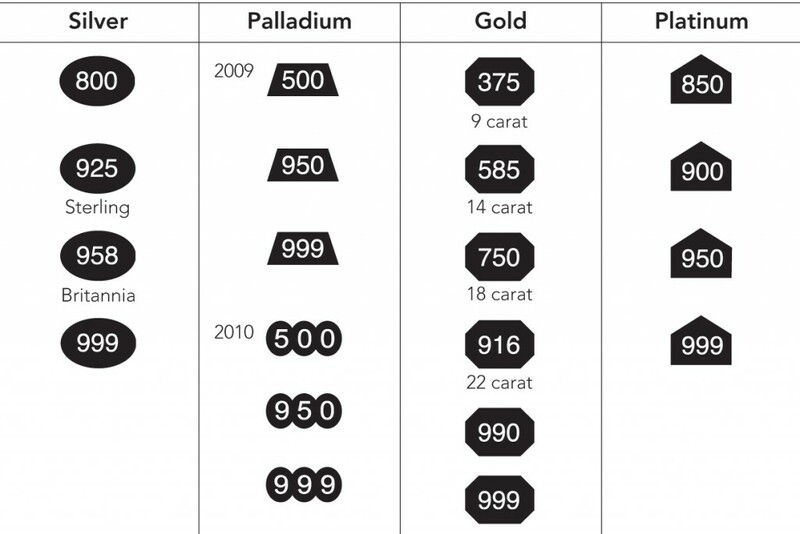 Check for the stamp: karat (10K, 14K, 18K, 22K or 24K). The ceramic plate test: Press your jewellery item across the surface of a ceramic flat plate. A black streak means it’s fake, a gold streak will show you it’s the real deal. If in doubt take it to a local jeweller who can do further tests to see if the item is real. 10. Costume jewellery will use fake glass or plastic gemstones. 11. Costume jewellery simply uses metal alloys, such as polished brass. Look out for corrosion which then leads onto itchy skin, discolouration or inflammation. 12. Does the price seem to good to be true? Chances are it’s a fake. What is the UK Government doing about it? The fight against digital piracy and counterfeit goods was boosted from (23 October 2014) by £3 million of new government funding to the City of London Police Intellectual Property Crime Unit (PIPCU). The Minister for Intellectual Property (IP), Baroness Neville-Rolfe announced the government’s funding commitment to the national crime unit at the Anti Counterfeiting Group Conference in London. The unit has now been operating for 1 year and this new funding will cover the next 2 years, up to 2017. “We’ve seen significant success in PIPCU’s first year of operation. This extra support will help the unit to build on this impressive record in the fight against intellectual property crime, which costs the UK at least £1.3 billion a year in lost profits and taxes. “With more money now being invested in ideas than factories or machinery in the UK, it is vital that we protect creators and consumers and the UK’s economic growth. Since its launch in September 2013, PIPCU has investigated more than £29 million-worth of IP crime and has suspended 2,359 internet domain names. It has seized more than £1.29 million-worth of suspected fake goods and has diverted more than five million visits to copyright-infringing websites. PIPCU has established itself as an integral part of the national response to a problem that is costing the UK more than a billion pounds a year. Much of this success is down to PIPCU moving away from traditional policing methods and embracing new and innovative tactics, to disrupt and dismantle criminal networks responsible for causing huge damages to legitimate businesses. The recent IP Crime Group Report, detailing all UK enforcement activity between 2013 and 2014, highlights innovative initiatives used by PIPCU to dismantle and disrupt criminal activity. The High Court in London ruled in favour of luxury goods group Richemont, ordering Internet Service Providers (ISPs) to block or impede access to websites selling counterfeit goods. What if I get caught selling fake jewellery? Four men were found guilty of conspiracy to defraud at York Crown Court after selling and distributing counterfeit copies of branded clothing, jewellery and other items. The ringleader was sentenced to 52 weeks in prison suspended for 12 months, any offence in that time triggering 250 hours community punishment; another was fined £1,000 and the other two ordered to each do 100 hours unpaid community work. The last three were ordered to pay a total of £1,750 prosecution costs and a lengthy financial investigation under the Proceeds of Crime Act resulted in a Confiscation. Order against the ringleader for over £82,500 which must be paid to the Court within six months or he will go to prison for another 21 months and still have to pay the amount of the Order. A woman offering various fake goods for sale on the Facebook social networking site was also investigated. She offered for sale clothing, jewellery, footwear, purses and handbags which on searching her address the officers found over 200 items with counterfeit trade marks. As a result, she faced 18 charges, under the Trade Marks Act 1994, of having the goods with a view to sale, the number of charges showing the range of different trade marks and types of goods. She pleaded guilty to all the offences and was sentenced at York Crown Court to 150 hours of unpaid community work. Once the financial investigation under the Proceeds of Crime Act is complete the same Crown Court will deal with any confiscation order.